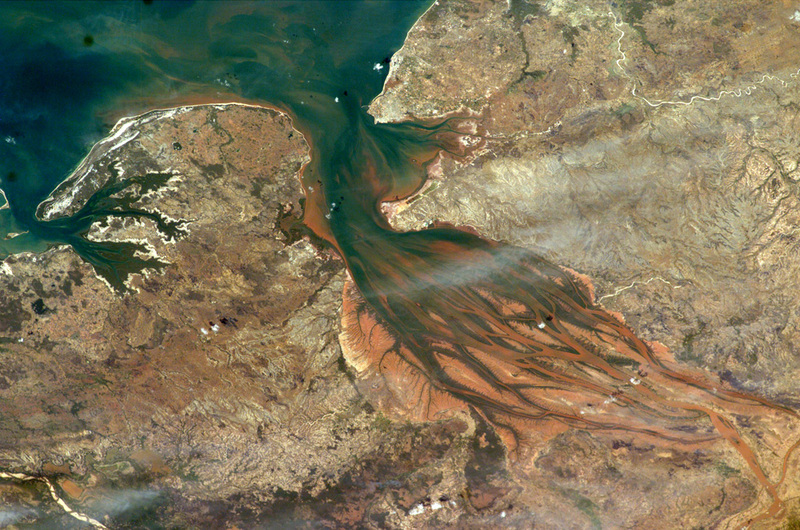 The Betsiboka Estuary on the northwest coast of Madagascar is the mouth of Madagascar’s largest river and one of the world’s fast-changing coastlines. Nearly a century of extensive logging of Madagascar’s rainforests and coastal mangroves has resulted in nearly complete clearing of the land and fantastic rates of erosion. After every heavy rain, the bright red soils are washed from the hillsides into the streams and rivers to the coast. 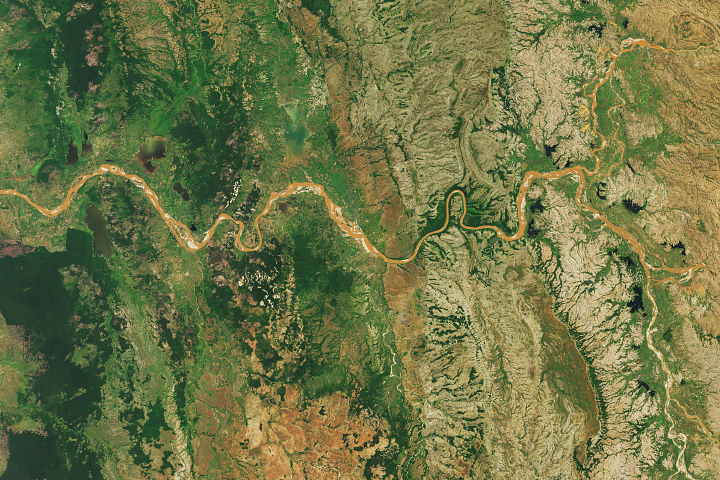 Astronauts describe their view of Madagascar as “bleeding into the ocean.” One impact of the extensive 20th century erosion is the filling and clogging of coastal waterways with sediment—a process that is well illustrated in the Betsiboka estuary. In fact, ocean-going ships were once able to travel up the Betsiboka estuary, but must now berth at the coast. A bad situation is made worse when tropical storms bring severe rainfall, greatly accelerating the rates of erosion. 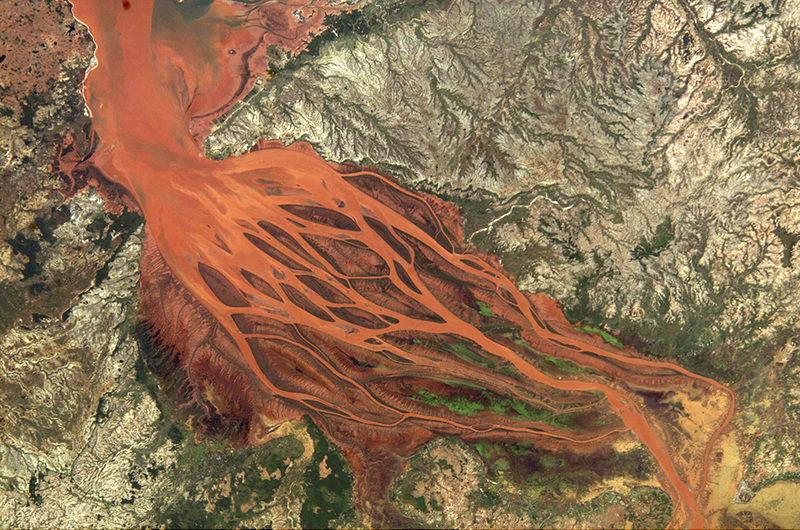 As an illustration, astronauts aboard the International Space Station documented widespread flooding and a massive red sediment plume flowing into the Betsiboka estuary and the ocean in the wake of Tropical Cyclone Gafilo, which hit northern Madagascar on March 7th and 8th, 2004 (top image). A comparative image (bottom) taken in September 2003 shows normal water levels in the estuary. The government of Madagascar has programs in place to control clearing of land, encourage reforestation, and reduce soil loss from hillslopes. Despite the heavy coastal flooding in the top image, new coastal developments can be seen. 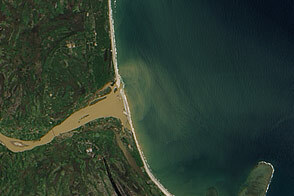 One such development is visible at Boanamary along the coastal region at the mouth of the estuary (inset images). This facility is a shrimp farm developed since 1999. 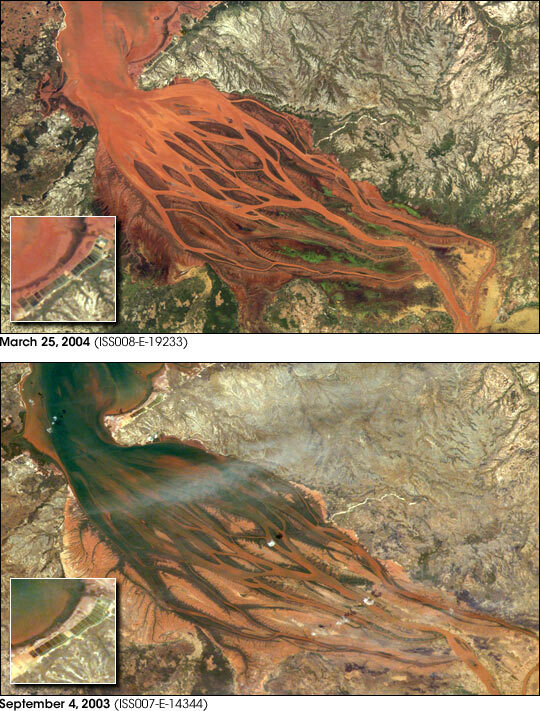 Successive images taken by astronauts show increasing numbers of ponds constructed between 2000 and the present. Coastal aquaculture projects are frequently controversial, pitting the protection and viability of coastal ecosystems (especially rapidly disappearing mangrove environments), against badly needed industry in developing countries. New developments must satisfy a variety of environmental regulations, before construction and during operation, to protect the coastal mangrove forests. Astronaut photograph ISS008-E-19233 was taken March 25, 2004, with a Kodak DCS760 digital camera equipped with an 195-mm lens. The bottom image, ISS007-E-14344 was taken with the same camera and a 180-mm lens on September 4, 2003. All images are provided by the Earth Observations Laboratory, Johnson Space Center. The International Space Station Program supports the laboratory to help astronauts take pictures of Earth that will be of the greatest value to scientists and the public, and to make those images freely available on the Internet. Additional images taken by astronauts and cosmonauts can be viewed at the NASA/JSC Gateway to Astronaut Photography of Earth.